Radio Shack TRS-80 PC-1 Pocket Computer – Planet Geek! I’m super excited about adding this piece of history to the Vintage Handheld Computing Collection. When i was in high school, I had a total geek crush on these units when they were came out . Handheld, ran basic, battery powered, very nifty looking. I acquired one back in the day (and have an interesting story about using it in a Physics exam), but haven’t had a chance to play with one since. This one was donated by one of my coworkers. It includes the cassette interface, the original docs and boxes, and the plastic overlays that were used for ‘functions’ – basically defined keys. It’s in good physical shape, but has a bad display. I haven’t had a chance to run up the batteries and dock for it, but physically, it’s in great shape. Even came with some financial add-on software. This particular unit is a PC-1 – the first generation of the pocket computer. 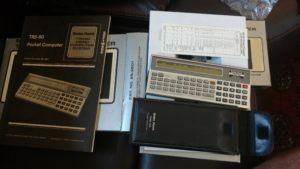 They were actually made by Sharp as the PC-1211, and rebranded as the TRS-80 Pocket Computer. The PC-1 moniker was added later as the line expanded into more models.